The PRO VLA (Vactrol® based Leveling Amplifier) is a multi-purpose tool for audio engineering and recording. 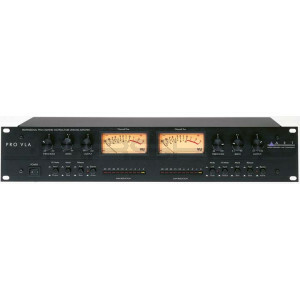 Enclosed in a 2U(3.5" high) rack-mountable chassis are two independent channels of analog leveling/compression designed to work seamlessly with any recording, sound-reinforcement, or electronic instrument setup. ART’s PRO VLA circuitry is a hybrid design utilizing the latest and most advanced analog and tube technology. Using a transformerless design throughout, the PRO VLA maintains exceptional signal integrity and extremely low noise. Its VCA-less design utilizes optical electronics (Vactrol) coupled with a 12AX7 vacuum tube gain stage for superior musical performance. The PRO VLA is a soft knee leveling amplifier by design. Although it is capable of providing a thoughougly "squashed" signal, the PRO VLA was designed to excel in areas where transparent, expressively musical dynamics control is desired. In addition to making signal levels more manageable, it is common practice to apply compression or limiting to a signal to make it louder or more "in-your-face". The benefit of using the PRO VLA for these applications is in its design. By utilizing opto-electronics, the PRO VLA allows you to add more compression without sounding like you’re squashing the daylights out of the signal. Unlike typical compressors which use VCA’s to control level detection, the PRO VLA is very musical. The nature of its operation is much like the way your eye adjusts to light. Just as your eye transparently adjusts to changes in light, the PRO VLA adjusts to changes in signal level. Developed in partnership with studio and live sound engineers, the PRO VLA possesses a "sound" that is not available from any other compressor on the market - at any price! The PRO VLA was designed and constructed with the absolute best components, assuring a lifetime of quiet, reliable performance.